The exterior of this case is constructed of 3/8 inch plywood with heavy gauge grey PVC laminate on the outside and black stained interior. The case is assembled with aluminum extrusions and machine split riveted throughout and finished with ball corners. All catches and handles on the case are spring loaded and recessed into the case for strength and sheer resistance. The heavy plastic tub drawers are sturdy, practically unbreakable and lightweight. The tub drawers slide on wood tracks and are completely removable. 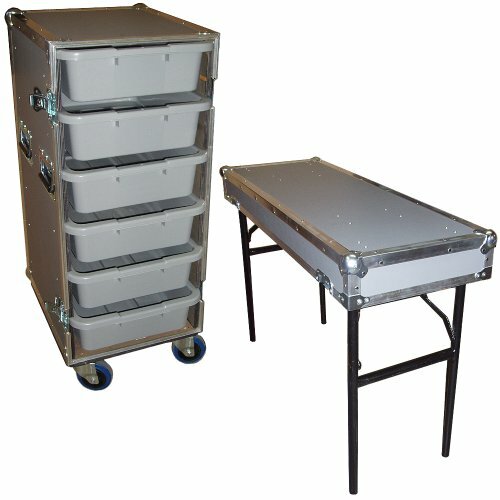 Two folding legs are attached to the front lid and easily fold out making a 30 inch high work table. This work box is ideally suited for music industry equipment, as well as in industrial settings and warehouses. A number of great construction features on these ATA cases also improves durability and makes them well suited for travel. Please note This case comes in grey only.